For the past four years I've spent tens of hours each week working on the "A view from the cycle path" blog. The original intention was to provide a reference for people who had been on our Study Tours, but the audience rapidly grew beyond the people who had been on our tours. I've attempted to build something which was a useful resource for cycling campaigners across the English speaking world and everywhere else that should be using the Netherlands as a reference for how to implement quality cycling infrastructure, but nearly always is not. There was a dearth of accurate information, and abundance of misinformation, about Dutch cycling policy in the English language. I sought to improve this situation. Unfortunately, the amount of work required to maintain the standards that I had set for myself grew well beyond what anyone can do merely as a hobby. The blog had no real income but was consuming a large part of my life. For a long time, I didn't mind this. I very much appreciated, and still appreciate, the comments and feedback from genuine readers. I hope that in turn, I have provided useful information to my readers. However, it increasingly became apparent that commercial organisations including magazines and newspapers, other websites and transport related organisations including the London Cycling Campaign, European Cyclists' Federation and Environmental Transport Association were taking an interest in my work. While some people from commercial organisations took the time to tell me that my work was "valuable", never did this "value" extend to offers of payment when they asked me to work for them. Some people seem to take a delight in pointing out that they have "no budget" to pay others while they themselves draw a regular salary. In other cases, my text and photos were copied without asking me and without giving any credit. Or articles appeared on issues not covered often in the English language shortly after I wrote about them, in which the text was re-written to say more or less the same thing. It is then impossible to prove a connection, of course. I've also been quoted out of context both by accident and on purpose by people who seemingly deliberately want to misconstrue what I've written. Photos have been taken from our website, sometimes used as they are and sometimes edited to remove our watermark image before using them. I find this all quite abusive. Apart from in cases of wholesale copying, I had no complaint when other unpaid bloggers referred to my work, perhaps "borrowing" a couple of photos and giving a link to the source. However, it's something else when people start to do this as part of their paid jobs. I'm not willing to be taken advantage of in this way. I am not doing other peoples' jobs for them without being paid their salary to do it. The blog was never meant as a reference to be used on its own in order to decide policy. What I've written rests upon our experience of living and working in both the UK and the Netherlands and riding tens of thousands of kilometres by bicycle in both countries. We have a view of the world which is different to both that of people who visit the Netherlands briefly and that of Dutch people who don't have the experience of living and cycling in other countries. Our Study Tour condenses our knowledge into three days, in which we demonstrate how things actually work, concentrating on those things which are most important. Relying on reading articles (including those on my blog) and looking at Google Maps to make assumptions about how things work does not give the full picture. There are many misconceptions spread by many people, often inadvertantly and with good intentions, but they are still misconceptions. I know of instances where planners from the UK have attempted to design "Dutch style" infrastructure based on nothing more than this remote view. The reason that I know this happens is that after starting, some of them have asked me questions about what they should do next - based on such distorted ideas as "Dutch style" cycling infrastructure with absolutely no cycle-paths. While it's clear that many of these people don't really know what they are doing, not one of them has ever come on a tour. Yet again, well paid professionals want free advice. They will actually start planning based in good part on what they have read on a blog. However, they won't pay our modest fee to be shown a good part of what they really need to know in order to do their jobs properly. While there are people who make a considerable amount of money out of blogs which consist of "reviews" and photos, that does not happen if you take the time to create long and original content. Really profitable blogs target people who want to buy things, because they click through on advertising. Writing paid for advertorials and "recommendations" also helps. I didn't do this. As a result, total income from advertising on the "A view from the cycle-path" blog never reached more than €18 per year. That's under 35 cents per week. This doesn't even cover minimum wage for the time taken to delete spam comments, let alone trying to correct misconceptions, find out who the latest person is who has started "borrowing" from me or to create original content. Eventually I had to accept that the value of something is very much what people are willing to pay for it. These days, knowledge has no value. Maintaining the blog has become a chore. This is not sustainable. For this reason, the blog has been deleted. I continue to blog about bicycle components on the website of our webshop. We also continue to organise cycling holidays. I have in the past let the London Cycling Campaign use my photos without payment. They appear in one of the LCC's videos, for instance. The incident with the LCC to which I took exception started on the first of August 2011. The LCC membership had overwhelmingly voted for a "Go Dutch" theme for the next year. There had been many misgivings amongst the members about this, due to a perceived lack of enthusiasm amongst the committee. The committee was not on the back foot and trying to catch up with its members. Mike Cavenett, Communications Officer of the LCC, sent email to the CEoGB and myself asking for permission to reproduce my article "Why the Netherlands is important for British cyclists" in the next issue of London Cyclist magazine. I initially said that they could indeed use the article, free of charge. However, it turned out that Mike didn't want the article as it stood, but wished to edit it. The edits which were made turned much of what I had said in the article on its head. Part way through what became a time-consuming series of re-edits, I suggested to Mike that he and other officials of the LCC would benefit from a tour to deal with their misunderstandings about cycling in the Netherlands. His response was "You're right of course about seeing things for ourselves, and some of us will be visiting Amsterdam and Rotterdam in the next few weeks". I asked what they would be doing and he replied "Marc from the Amsterdamize blog has kindly offered to show us around the capital, and has put us in touch with someone for Rotterdam too. We did consider your services of course, but our budget for this trip is very low and it would be an imposition to expect a free tour from a professional such as yourself. I hope we didn't offend by going elsewhere - your expertise in this area is clear to us, but it didn't seem to be the right solution on this occasion." The LCC really is not a small organisation with no money. They spent an awful lot of it recently on publicity their rather fuzzy ideas for "Go Dutch", achieving a large number of extra subscriptions as a result. After their big launch this year, they even appointed a communications agency to send email to bloggers like me to encourage us to support them. There is plenty of money for things that the LCC staff think are important, such as marketing themselves. The budget was zero only when it came to the research which stood behind this major policy change. It appears to me that the LCC knows the price of everything, but the value of nothing. The rest of this email from Mike included another re-edit which made it obvious to me that Mike still didn't "get it" as again it had not remotely the same meaning as the words in my original article. I've reconsidered. I don't want to write an article for the LCC at this time. We do this for a living and we're good at it. Our expertise and time should be valued. We have a unique experience of living and cycling both in the UK and here. We can offer insights which won't get from anyone else. If you were coming for a study tour, I'd have a lot more patience with the request for free work on an article. However, this is really something completely different. We contacted people in LCC as long ago as 2006 and 2008 to offer a tour. Since then I've responded positively to requests for free use of photos and text. However, we now discover that at the same time as our expertise is valued enough that you ask for information from us about cycling in the Netherlands, and would like us to provide an article and photos for free for the magazine, we're not valued enough for your organisation to even consider our services as part of your tour. The LCC is not a small organisation. It has a revenue of over a million pounds per year, much of which goes on paying the salaries of 14 staff members. You are perhaps one of them. I dare say that you don't expect to work for nothing. We're being taken for fools. We don't owe the LCC, it's staff or its members anything at all. We've spent years working in cycling campaigning and other organisations in the UK for free. These days we do quite enough already for free on the blog without asking for a penny in return. We give money to charity and try to help people. These things are our gift to give, not something that someone else can ask for and expect from us. Another example of the LCC's methods of research came along in November. Before my post about it in January 2011, the Dutch protest movement "Stop de Kindermoord" was rarely discussed in the English language, but after this time quite a few posts appeared on English speaking cycling blogs. In October 2011, Mark Wagenbuur made a very nice video which also referred to Stop de Kindermoord. He also wrote a post about it for "A view from the cycle-path". This did even more to make the movement known in the English speaking world. In November 2011, Mike Cavenett sent email to Marc van Woudenburg at Amsterdamize including a link to Mark Wagenbuur's post on my blog, asking "Were you responsible for putting together this excellent video and blog post?" and going on to ask to use images from Mark Wagenbuur's video showing the "Stop de Kindermoord" protest. Mike Cavenett's own article for the LCC about "Stop de Kindermoord" appeared in February 2012. The introduction to Mike's new article has a similar theme to the introduction to my "Why the Netherlands is important for British Cyclists". I'm just writing a quick email from the European Cyclists' Federation to wonder if you'd like to collaborate on a myths and facts brochure that we're hoping to compile for our new website launch at the end of this month. You have quite a reputation in the bicycle world, and we regularly look at your blog for a whole range of policy insights. I was envisaging drafting up a myths and facts brochure which would be downloadable and free for anybody to distribute. The idea is to have a "Top Ten Cycling Myths". I came across this post of yours, (http://hembrow.blogspot.com/2011/02/all-those-myths-and-excuses-in-one-post.html) and thought perhaps we could collaborate to knock all those nasty myths made by politicians into an easy to read and attractive booklet? Unfortunately we couldn't offer you any sort of remuneration if you were willing to help out, but we would of course pay for all the design costs, and make sure that you're credited as a co-author, as well as allowing you to distribute the PDF on your own blog? So now we find out what he wants. He wants to use text from my blog in a booklet. I am, of course, not to be paid for this work, but I do get to be "credited as co-author" of my work, and what's more I would be allowed to distribute a PDF file which promotes the ECF on my blog. I'm very happy to hear that you read my blog and find it insightful. A lot of people write to me to say that they like the blog, and a lot of people tell me I've attained a reputation through it. Unfortunately, while this has lead to a lot of people valuing my work, it has not lead to many people valuing it enough that think my time is worth anything. I get several requests every week for me to do work for free. This can be writing articles for magazines, assisting with other people's articles, proof reading, advising on planning issues, making videos on specific topics, taking photos of particular types of infrastructure, advising on technical issues with bikes or indeed with help making lists of one thing or another. However, for some reason my reputation doesn't seem to attract paid work. I have put thousands of hours into the blog and supporting cycling through campaigning. These days it consumes as much time as many people spend on a full time job, but I do this without a salary as reward. For this reason I have to turn down your request. It's gone far enough. I am available for paid work, but not for unpaid work. So tell us about all the myths you've heard. "I'm just writing a quick email from the European Cyclists' Federation to wonder if you'd like to collaborate on a myths and facts brochure that we're hoping to compile for our new website launch at the end of this month. You have quite a reputation in the bicycle world, and we regularly look at your blog for a whole range of policy insights." It went on to say that what they were interested in was that I should work for them on a version of my blog posts entitled "All those myths and excuses in one post". Like most such requests that I get, this one pointed out that "Unfortunately we couldn't offer you any sort of remuneration if you were willing to help out". As it happens, I feel differently about this when it comes from someone who gives their own time for free than I do when it comes from a paid staff member of an organisation which has money and does actually have a budget for spending on things like this. My reply to the ECF was the same as two others sent that week, pointing out that an asymmetrical "collaboration" between two parties in which only one party is paid for their time is not a reasonable way of going about getting things done. If they find what I write so worthwhile that they read it regularly because I write things which they find insightful, why not offer to work with me on a more equal footing so that I can perhaps continue to spend time on the blog ? Naturally, I heard no more from the ECF staff member. So now they're looking for information again, but using a different tack this time. Frankly I’m getting a bit fed up with these attitudes. p.s. The blog post is still there, and still has a nice long list of myths and excuses. Only after I made this post on their public forum did I receive a reply by email. Of course, it was still not offering to actually pay me for writing for the ECF. After I closed the blog, and people asked about this on Twitter, Julian made an extraordinary tweet on behalf of the ECF which reveals the attitudes at work. It said: "People would be willing to pay for @davidhembrow 's work. He just needs to market himself more like @copenhagenize and @amsterdamize". Just as with the LCC, it seems that marketing is the only thing that matters to and impresses the ECF. Apart from this public tweet, the ECF have not responded to me about the closure of the blog. The ETA is primarily known to its customers as a car rescue service. For many people, the ETA is preferable to the RAC or AA because they are not involved in lobbying for roads. The photo which I know of on the ETA website is that which is shown to the right. It was cropped to remove the text and used on a blog post by Andrew Davis (since removed). Again, apologies. It was originally lifted for internal training purposes - must of our staff have not been to the Netherland or Denmark. It was not intended for broadcast. We will happily add the link. Let me assure you that we normally ask before broadcast and permission is always given. This is just a mix up and no one else's fault but mine. Now the ETA were at least gracious enough to include a link. However, it was only with this email that I found out my material is being used for internal training in the ETA. I have no idea in what context they use it, and as their staff mostly have not been to the Netherlands, it is quite likely that there are many misconceptions about what this country is like. In their view, it seems the only mistake they thought they'd made was that of using the photo in public. However, this is not the way in which copyright law works. Try it with, for example, Microsoft. Let them know that you use their software only for "internal training purposes" and therefore do not think you need to pay them. The ETA doesn't offer a free car rescue service. This would be impossible because there are costs involved, and the ETA needs to make a profit. Likewise, we don't provide a free photographic service. We have costs too, and we also need to make a profit in order to live. While we lived in the UK, we were members of the ETA. Our subscription fee helped to pay the salary of ETA staff members including Andrew Davis. The ETA have not responded to me about the closure of the blog. There is of course nothing new about commercial enterprises leaning on "volunteers" to do work. Photographers have this problem all the time, as do rather better authors than myself. Our client, Transport for London, has commissioned my company to do a series of case studies on exemplary transport projects throughout the world, to give them ideas on the best way to upgrade a number of streets throughout the city. One of the projects they’ve asked us to look at are the streets in Assen: Noordersingel, Brinkstraat, Nieuwe Huizen and Groingerstraat. My search is proving difficult due to the difference in language, however I did come across your blog, and I was wondering if you knew where I would be able to find some detailed information on the project? I need to know things such as the cost of the project, the transport policy behind it, the year the project began and finished, etc. I apologise for the somewhat random email, however if you are able to help in any way it would be very much appreciated. All polite enough, but the angle was obvious. This was going to turn into another opportunity for me to be able to "help" someone who is paid for their work. The email I received in return started off "Thank you very much for your email and the wealth of information you have provided on your blog. I found the footage and photographs particularly interesting and extremely useful for the case study." before continuing with "you and your website will be fully acknowledged in our documentation and I will include a link to your cycle tours website". We have looked into this and our client has not agreed for us to buy information for this project. Therefore we are using only publicly available sources. ‪Thank you for your assistance to date, and apologies if we have caused any inconvenience. So there we have it. From a company which charges a considerable rate for its employees' time, I receive an email containing the absurd notion that TfL have no budget to pay for people to do the research that they say they want done. If Transport for London want to know about Assen and they only found out about the city because somewhere there reads my blog and watches my youtube videos, then why didn't they contact my directly instead of appointing an expensive international firm of architects who don't even have the information that TfL is asking for ? This is beyond ridiculous, but it also appears to be normal so far as this blog is concerned. People appreciate the information which I have made available, and many use it in the way it was intended. However, there are also many people who want me, in effect, to work for free so that they can use my work to further their own careers. That is not acceptable to me. A few days later, TfL awarded contracts worth 1.2 billion pounds, to be added to 1.4 billion from other sources, to be spent on maintenance as well as design and construction of new schemes in London. Steer Davies Gleeve are clearly amongst the beneficiaries of TfL's billions and I find it quite astonishing that they imagine I will believe that the one thing they have no budget for is paying for information from the only person who has the information that they need. No-one asked us to start organising study tours, and no-one asked me to start blogging either. While we charged for most study tours, only some of them ran at a profit and that profit was never large. Taken as a whole, the total revenue from study tours did not meet the total cost of organising them. We subsidized tours in the past because we believed in what we were doing. While the blog didn't have such large outgoings associated with it as the tours did, it was a black-hole for time. In both cases we hoped that the expense might at some point be offset by attracting work from organisations like LCC, ECF, ETA and TfL. All of these multi million pound enterprises pay their staff and subcontractors well. However it has become clear that the type of people who those organisations employ see bloggers like myself as nothing more than a chance to have their work done for them for free. Organisations like these, and I'm sure there are others who I don't know about who are using my work without even asking, have proven that what we have done is of value, that our knowledge is valuable to them, and that in many cases they want us to directly work for them. However, they have also proven that they think that we want to do their work for them for free. We will not work for commercial enterprises for no reward. You might think that our ability to aid communication between Dutch and British people might be valued on this side of the North Sea, but it is not. It appears that we're simply not "Dutch" enough to be taken seriously, and for that reason our unique insight which comes from the fact that we've lived in and cycled for long periods in different countries, that we see things that the Dutch don't, and that because we're native speakers of English we've been able to spot when the Dutch make particularly bad mistakes with translations of their own material, seems to count for nothing. There has been some acknowledgement here, but it doesn't add up to much. I was interviewed for the Fietsberaad newsletter, and though I submitted my piece in both Dutch and English in an attempt to prevent confusion they didn't print what I wrote but substituted opinions quite the opposite of my own and printed the result without asking for confirmation. It's a classic example of the confusion that so often reigns when Dutch and British people communicate with one another, and something that we could have helped to prevent if the Dutch were not overconfident about their ability in English. The situation here recently changed such that some bloggers and others with interest in cycling in the Netherlands, people who have referenced material as part of building their own, receive funding or are invited on expenses paid trips. This comes in part from the taxes that we pay in the Netherlands but we are not included in whatever club it is that you have to be a member of. This is not something we're willing to continue to support. So thank you to all the genuine readers of the blog, those who made positive comments and supported us, and to those who came on the tours. The blog is now closed. I will not continue to work hard on something substantial like this only to see it being taking advantage of by others. We are continuing with our businesses in the Netherlands, DutchBikeBits.com and Hembrow Cycling Holidays. Through the latter we are available for paid consultancy and can still organise study tours on a commercial basis on which you will be able to take advantage of our knowledge gained by living and cycling in both countries - still something you won't find elsewhere. Also see our other blogs, the Dutch Bike Bits.com blog about bicycle components, the Hembrow Cycling Holidays blog about cycle holidays in the Netherlands and my personal blog about things other than cycling. Love London, Go "slight head start at the ASL" ? 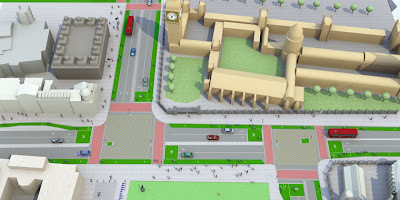 A few days ago over on the Pedestrianize London blog, Paul James put together a very good critique of the 'lack of ambition and "Dutchness"' of the London Cycling Campaign's plans for Parliament Square. For his post, he edited the LCC image to create something which looked considerably more Dutch. In particular, Paul deleted the on-road advanced stop lines (aka ASLs or Bike Boxes) and the on-road cycle lanes. Quite right too, as these are something which are not really "Dutch". They exist, but they're rare, and shouldn't be found in a modern design for a busy street like this. Discussion followed, with several people saying that they preferred Paul's vision. Mike Cavenett, Communications Officer of the LCC, explained thus: "We favour ASLs because they give confident cyclists an advantage (however, slight) at traffic signals. They're not a substitute for proper bike tracks, they're complementary. Confident cyclists can use them and ride on the carriageway, while less confident ones will use the kerbed tracks that are part of every busy street." It's quite extraordinary that the LCC should "favour" advanced stop lines as part of a campaign called "Go Dutch", because ASLs are actually rare in the Netherlands. When this post was discussed elsewhere, and a suggestion was made that mistakes were being "copied from the Dutch who invented the things in the first place" this made me think about the last time that I actually saw an ASL in the Netherlands. These days, ASLs are British much more than they are Dutch. It does depend on where you go, of course, but while we're surrounded by high quality cycling infrastructure in Assen, there isn't an ASL anywhere in this city. There also isn't one on any of the routes I follow regularly into the countryside, through other cities, villages and towns. The closest I'm aware of is 30 km North of here in Groningen. They're not all that common in that city either, and are not found on the main routes for cyclists that I usually use or on large junctions as they are being suggested for in London. Dutch cyclists manage quite well without ASLs because of more advanced traffic light and roundabout designs, as well as many opportunities to take routes which avoid signaled junctions. Just because something can be found, somewhere, in the Netherlands, that doesn't imply that it's a good example worth copying and branding as "Dutch" elsewhere. Bristol, Britain's "Cycling City". 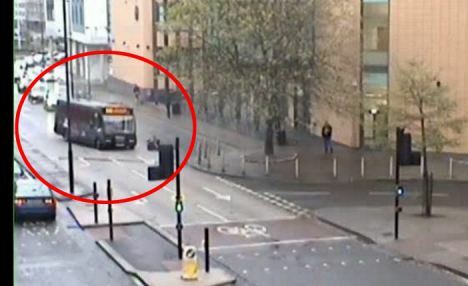 Note how an advanced stop line completely failed to help a cyclist who was the victim of a deliberate attack by a bus driver (click on the underlined text if you wish to see the rather shocking video). The street on which this incident happened already has cycling infrastructure as "favoured" by many campaigners in the UK in the shape of an Advanced Stop Line. However, this infrastructure played no part at all in keeping the cyclist safe. Actually, ASLs and other paint on the road do nothing to reduce conflict on the streets. Indeed, in encouraging cyclists to try to get past cars which are in the lanes which lead up to the ASL they can actually promote conflict. I'm not the only person to have noted that if you find your way into an ASL in the UK, it's likely to have a car in it. Dutch, Danish, or something else ? ASLs were not the only aspect of the LCCs design which was discussed in the comments on Paul's blog post. Richard Lewis, who produced the design for the LCC, also joined in: "The un-Dutch lanes. I agree that the tracks and lanes are hardly Dutch in design. This is because they are mainly Danish. So is "Go Dutch" actually "Go Danish" ? It shouldn't be. In my view, Danish junction design at major intersections is less good than Dutch design because it promotes conflict and causes cyclists to have to make multi-stage turns more than Dutch junctions. Danish junction design has proven to be lethal. However, I'm quite sure that the Danes wouldn't put an ASL here either. Richard carries on to say "I've actually done a 'hybrid' of both". There's an explanation of why: "Essentially this is because Dutch designs are actually so good that British engineers won't go near them, and because Danish designs are pretty good (and getting better over time) but are also much more transferable. " Actually, though, these proposals are neither Dutch nor Danish nor a hybrid, but something new and unproven. Instead of the LCC asking for best practice, they are still asking for something less. Compromises are being made before even starting a process of negotiation. I wrote before about how this timid approach will never lead to the needed change. It's akin to Rosa Parks having asked merely for the signs on the bus to be in a fixed position. It's not just at Parliament square that the LCC are making proposals for advanced stop lines at busy junctions. Until I read the article that it accompanied, I thought this diagram was a demonstration of what not to do. It may fit well with the preconceptions of people who think that ASLs "give confident cyclists an advantage" but this is an overly complex junction design which makes a mockery of proper cycling infrastructure and everything that sustainable safety principles argue against. This confusing jumble of different types of infrastructure puts cyclists directly into conflict with drivers as they attempt to reach those advanced stop line bike boxes. I am completely at a loss to explain how this type of infrastructure could be thought to make London more like a Dutch city. The Dutch don't design two speed infrastructure. In my view, what is being proposed here is actually worse than the proposal from Transport for London. Last year, the LCC held a vote to discover which theme its members would like it to campaign on. Four different choices were given, and "Going Dutch" won by a mile with nearly 60% of the total votes cast. However, the leadership of the organisation had long been opposed to Dutch style infrastructure (much discussed on the late and lamented Crap Waltham Forest blog) and from the start, the proposal for "Going Dutch" was couched in particularly vague language and discussed in a way which indicated a lack of enthusiasm for what the membership had voted for. "Road space" is such a woolly term. The LCC has worded it like this to be attractive to your mum/gran/son who sees the pretty picture of a segregated cycle track, whilst suggesting a simply more blue paint to appease the lycra warriers who want to keep the right to cycle at 20mph in A-roads round central London. I really don't know what I'm voting for here. The title "Going Dutch" should by principally about segregation. Please LCC don't shy away from this word. He goes on to say: We need roads that my mum/gran/son will be drawn to cycle in. The ONLY way to avoid the BATTLE on the roads is to be segregated, like in Holland. NO to blue paint. NO to wide roads. YES to physical barriers protecting cyclists along main roads. He didn't say so specifically, but I'm pretty sure that writer was not asking for more ASLs, and it's quite clear that he was not asking for on-road cycle-lanes. In the last few weeks, the staff of the London Cycling Campaign, several of whom have publishing, marketing and fund-raising backgrounds, have done a good job of what they do well. They've produced a lot of text, achieved a lot of press for their campaign, and boosted membership of the organisation. While it looks great, what has been produced is a bit hollow. They still don't really seem to understand either how Dutch infrastructure is designed and works, or what "Going Dutch" meant to the people who voted for that option and who pay their salaries. Instead of asking for what its members asked for. i.e. replication of Dutch conditions for cycling on London's roads, the LCC continues to promote less than ideal solutions, such as (but not limited to) Advanced Stop Lines (Bike Boxes) and on-road lanes. Woolly terms like "clear space" continue to appear in LCC literature and there is a lack of ambition for real change. Rather than designing for the 8-80 age range, so that all Londoners could cycle just as all types of Dutch people cycle, the LCC is still designing for the 18-38 age range who are least concerned about subjective safety. With their current ambitions, a more accurate name for LCC's 2012 theme could well be "Love London, Go slight_head_start_at_the_ASL". If you want to support a campaigning group which is really dedicated to bringing Dutch infrastructure to the UK, support the Cycling Embassy of Great Britain. To find out for yourself what Dutch infrastructure really looks like and how it is used, book a study tour. In three days we present a condensed view of our experience of living in and cycling tens of thousands of kilometres in both countries. As I couldn't find it online, the picture of Bow proposal came thanks to the anonymous (unless he doesn't want to be) person who sent me a copy of the LCC's beautifully presented "Love London, Go Dutch" press pack. If cycling could be boosted by mere "branding" there would be no problems. 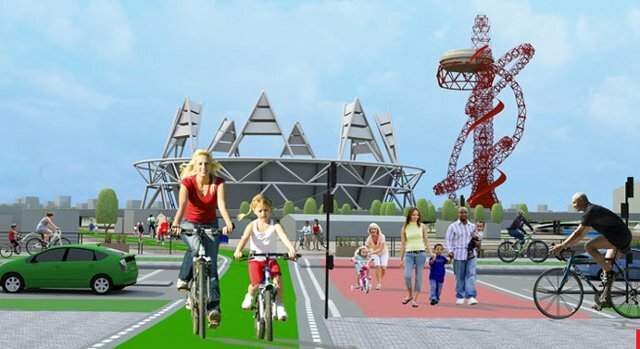 In its proposals for the Olympic Park in London, the London Cycling Campaign has produced some very nice glossy looking computer mock-ups of their vision for this enormous new sports facility. On behalf of the cyclists of London, The LCC is asking for three metre wide bidirectional cycle-paths for routes past and through the facility. In the second picture, the bidirectional cycle path looks barely two metres wide. It is also not clear how the guy in black is supposed to make a safe right turn at this junction to head towards the stadium. Last year, the LCC was pushed by its membership into asking for Dutch style infrastructure. Unfortunately, they still don't really understand what they are asking for and are still not asking for anywhere near enough. This has not stood in the way of making demands which are often rather inadequate or of producing glossy pictures to illustrate those demands. I think it's instructive to compare with a typical small sports facility here in Assen, which is itself a fairly typical small Dutch town. Other sports facilities in this city and across the country are served in much the same way. Cycle-path past the same new suburb's sports centre. 4 metres wide and well separated from the road. No problems here with making turns. Note that the road, with a single lane in each direction, is one of just two entrances by car for a development of 9000 homes. There are many routes by bicycle. It's not just in new developments in the Netherlands or in Assen that cycling is a normal way to reach sport facilities. I took this in 2007 outside a local swimming pool in Roermond, a town in the south of the country. Britain is still planning for lower a lower cycling modal share in new developments than the Netherlands was planning for thirty years ago. To achieve change, campaigners in the UK need to have higher aspirations. More later on how the LCC still doesn't really understand what "Going Dutch" should have meant. The Olympics has been and gone in London, and the mess left behind in the Olympic park area doesn't even slightly resemble anything the Dutch would build or what was shown in the promotional video. See Hackney Cyclist's blog about it. Having low aspirations like the LCC and other British campaign groups, does not result in progress. Rather, it helps to keep the UK "40 years behind". Yes, there's someone walking their dog by bike in the second photo. This is not unusual in the Netherlands. Will "Love London, Go Dutch" result in the same happening all across London ? Want to know more about the differences between the UK and the Netherlands ? We've lived in and ridden many tens of thousands of km in both countries. This gives us a unique insight which we condense into three days of study tour. By now I would think that many of my readers will be familiar to some extent with The Times' "Cities fit for cycling" campaign. I was included in a mailshot and asked to pledge support for The Times' campaign two days before it started. I was not told what I would be supporting, and a flurry of emails revealed anomalies about what might be part of their campaign, so I decided to wish them luck, hope for the best, but not to pledge support to something which I could not be sure about. In itself, seeing a major newspaper come out in support of cyclists is positive. This came about as a result of one of their colleagues being seriously injured, and I'm sure that everyone involved is quite earnest about wanting change. Also, it's really a good thing to see some of the issues that face British cyclists getting an airing in the national press. Over the last week The Times has published a lot of stories about cycling and I've read most of the articles. Unsurprisingly, some are better than others. Overall there are a lot more articles consisting of emotional appeal than actual details of what is wrong and what needs to be done. I think it's time for a response. More noise on the streets ? More complexity ? None of this is needed if conflict is designed out of the streets. This initially sounds good, but why only 500 junctions out of thousands ? Also, this suggests that the rather inadequate "solutions" of installing extra traffic lights or Trixi mirrors on existing junction designs are enough even for the 500 most dangerous junctions. For British people to cyclists need properly designed streets and junctions, not small measures like advanced stop lines they get a few seconds extra green time on the same roads in order to try to outrun cars. The Times has also got behind the idea of allowing cyclists to turn left on a red light, an idea which they credit to Paris but which has actually been allowed for a long time in many places in the Netherlands. In this country it is not a blanket permission but applies only where infrastructure removes conflict and makes it safe. I can't argue with the need to have accurate measurements, but why do they not already exist ? £100 million is an impressive sounding number, but actually it isn't nearly enough. This is just £1.94, or €2.30, per person per year. By comparison, the Netherlands already spends €30 per person per year. The Times' proposal calls for nowhere near enough money to achieve "world-class cycling infrastructure". England will continue to fall behind with this level of expenditure. Any grading that results should be a way of making sure that improvements are real, not a way for cities to hype themselves. There is already far too much hype, with competing "cycling cities" exaggerating their claims. While not completely free of hype, it is less in the Netherlands, where even Groningen didn't get to call itself a Cycling City last year. No British city is remotely like Groningen. This has long been something that cyclists in the UK have discussed. However, training of cyclists and drivers has a far smaller effect on safety than infrastructural changes. The Dutch follow sustainable safety guidelines to make roads safer by design even if mistakes are made by road users. No matter how good training is, and mistakes will continue to be made because people are not perfect. A good start, but why stop there ? 20 mph limits are also better where there are cycle-lanes. In the Netherlands you sometimes find a 30 km/h speed limit even with completely separated cycle-paths, and through villages. Again, The Netherlands leads the way, with a third of all Dutch roads already having a 30 km/h or lower speed limit. However, merely reducing the speed limit is not a panacea. It has been shown to no longer be quite so effective as it once was. When cyclists are not on segregated cycle-paths they benefit greatly from streets which have been made to be unattractive to through traffic. The fewer motor vehicles, and the slower that they travel, the safer it is for pedestrians and cyclists. In the Netherlands roads have been transformed to exclude motor vehicles not only on individual streets but also across whole cities. This one is a mystery to me. The Times' is a relatively right leaning paper so perhaps that's the explanation for why this item should appear in their manifesto. Why otherwise should construction of cycle-paths require sponsorship any more than the construction of roads does ? Are cycle-paths less important than roads ? Yes, let's have someone in charge, but will such a commissioner have real authority ? Most cities already have, or had, "cycling officers", but their positions are insecure and some have recently been made made redundant. Unfortunately, even when cycling officers are employed, they are not necessarily listened to. The Times has made an excellent job of creating a buzz and of getting mass support. However, it is unfortunate that they didn't do more investigation of issues before writing their manifesto. As it stands, they have simply have not been ambitious enough. Much of the manifesto reads rather similarly to TfL's "Cycle Safety Action Plan" of 2010. 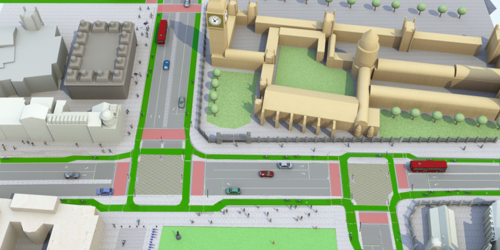 For instance, London has already been busy with a review of junctions, but that has resulted not in real improvements for cyclists but in rather inadequate proposals for Bow and Blackfriars amongst other places. Merely asking for a review and expecting that it will turn out well is not enough. The Times' call for additional funding is unfortunately particularly feeble, the extent that it works against any real progress being possible. Politicians from all parties are 'supporting' The Times' campaign. I'm not surprised as to many of them it must seem like a gift. They can get good publicity by saying they'll support the campaign, with no risk of actually really having to do too much. British politicians in any case have a long history of offering support to cycling when asked, making big promises, but not actually going through with it. Even within the first week of this campaign, the Road Safety Minister had already said he was "wary of calls to switch money from a national roads budget to cycling". It is not clear how long The Times' attention will remain on cycling. Verbal support from politicians may be offered now, only to evaporate once the spotlight moves on. 25000 signatures sounds like a lot, but in a population of over 60 million it's far from a mass movement. Considerably larger protests have been ignored in recent history by many of the same politicians. Unfortunately, because the manifesto is weak, even if everything that The Times requested was to happen, the government would still have got off rather lightly. This can leave campaigners in a very difficult situation, of having achieved all that "they asked for" but not being happy with the result. Unfortunately, British cycling infrastructure is known across the world for its lack of quality. I know it's exciting to see a newspaper taking notice of cycling, but too much unthinking hype has condensed around The Times' campaign. Yes it's very glossy, and the celebrity and politician support impresses many, but unfortunately the two months that they spent researching were not enough to result in asking the right questions or suggesting the right solutions. In fact, the manifesto could be seen as being quite dangerous due to it setting such a low bar for improvement. For Britain to ever achieve something which approaches best practice in cycling will take a lot more than this. Don't get too carried away with what is being called for by The Times. Try to keep politicians to any promises that they make, but actually campaigners need to be asking them for an awful lot more than The Times is asking them for. Given the low aspirations of the manifesto it could easily be the case that a little "negotiation" could result in requests for change being diluted to the point where they are irrelevant. People outside the UK, including in Italy from where a popular sports newspaper, La Gazzetta Dello Sport, has joined in to support The Times' campaign, should be especially wary of taking too much notice of this. This is a campaign by a newspaper which has a patchy history so far as cycling is concerned. The aims of the campaign are not enough for the UK to achieve mass cycling, and they're not enough for Italy or other countries to do so either. If you want to know what is required to cause a real change in the transport habits of a population, you need to look at the Netherlands, at a real example of mass cycling, not be distracted by a smoke and mirrors show from the UK. The Times isn't alone amongst British newspapers in suddenly deciding to support cycling. Five years ago it was The Guardian supplement of March 2007 which sold quite a few newspapers to cyclists. Jon Snow wrote about being an embattled pedaller amongst other articles which were mainly about sports cycling. Nothing really changed. London's Evening Standard also had a campaign in 2007. Again, nothing changed. The Independent supposedly had backing from the Government for their campaign in April 2011, but even with this "support", nothing changed. We contacted The Times, The Guardian and several other British newspapers in both 2006 and 2008 to suggest that they might perhaps take an interest in the study tours we organise to demonstrate the differences between Dutch and British infrastructure and how it relates to the different cycling modal shares of the two countries. We cram in a lot more than anyone is likely to pick up on their own in a short period of time. There were no replies. Like many people new to cycle campaigning, The Times journalists were sucked in by the hype from Copenhagen. However, I was amused to see in their video from the city that Copenhagen now only claims my figure of 10000 cyclists per day over a route where they used to claim 36000 passed each day. Perhaps it's because I pointed out an error in one of their press releases. The Highways Agency, mentioned in point number 4, is only responsible for England. Funding in Scotland, Wales and Northern Ireland is not addressed by The Times' manifesto. What's smug and deserves to be decapitated ? "A festive custom we could do worse than foster would be stringing piano wire across country lanes to decapitate cyclists. It's not just the Lycra, though Heaven knows this atrocity alone should be a capital offence; nor the helmets, though these ludicrous items of headgear are designed to protect the only part of a cyclist that is not usefully employed; nor the self-righteousness, though a small band of sports cyclists on winter's morning emits more of that than a cathedral at evensong; nor even the brutish disregard for all other road users, though the lynching of a cyclist by a mob of mothers with pushchairs would be a joy to witness." There was, understandably, quite an outrage about this. If such an incitement of violence had been against a different minority group then it might have resulted in a different outcome, but Matthew had the support of his editor. A week later, Matthew Parris issued an apology and the Press Complaints Commission decided that their code of practice had not been breached. To this day, Matthew Parris still writes for The Times newspaper. In both 2006 and 2008 we contacted The Times, amongst other British newspapers, to invite them to take an interest in our study tours of infrastructure in the Netherlands. There was no reply. As is usual for Dutch villages, De Groeve is connected by cycle-paths to the nearest town. The existing cycle-path was quite good. I was very impressed when I first rode along it in 2008. There was really just one problem with this cycle-path. At night it was not well enough lit for parents to feel that their children were safe riding to and from school. A few months ago something new was installed. The new lights will operate at night time at half power, but passing cyclists can press a button at either end of the route to switch the lights onto full power for enough time to ride the 3 km distance. This measure reduces both energy consumption and disturbance of night-time wildlife due to the lights. If it's successful, the same system will be installed at other locations in Drenthe. We already have other wildlife friendly lighting, such as green tinted LED cycle-path lighting at several locations in Assen. Meanwhile, According to a press-release from the Stichting Consument en Veiligheid, more Dutch children are having accidents with their bikes due to more of them having mobile phones and more of them using those phones while cycling (please note that as pointed out in the comments, not everyone agrees there has been a rise in danger and the Stichting has itself been criticised for being alarmist. I have learnt not to read much that I read in press releases about cycling). Of course, every one of the children who is interviewed says that they behave perfectly and it's everyone else and not them. All the children being interviewed claim to be extremely careful and don't use their phones while cycling, though one admits to listening to music. No-one wants children to be in danger, so extra safety lessons are being given in order to try to convince children not to use mobile phones while cycling to school. This is perhaps not entirely a bad thing. Both of these videos demonstrate one thing quite clearly, though. It's normal in the Netherlands for small children to cycle to school, in daylight, at night time, in the summer, in the winter. Mostly they do this unaccompanied by adults (on average this is by the age of 8 and a half). In order for this to happen it must be safe enough for children to cycle without parents becoming overly worried about their childrens' safety. The literature that children are given does not emphasize helmets and reflectives as these are remarkably ineffective in increasing all three types of safety in comparison with working on sustainable safety measures. spotted my daughter studying this. Almost all the bikes in the videos are fitted with dynamo lighting systems so that the lights are always present, reliable, and never have a flat battery. I recently wrote a comprehensive guide to selecting, installing and trouble-shooting dynamo lighting.